The Orange County Track and Field Championships boys team title race came down to the 4×400-meter relay, the final event of the day on Saturday, April 14 at Mission Viejo High School. Dana Hills, owner of the top county 4×400 time going into the day, made its title claim in record-setting fashion. The Dolphins’ 4×400 team of junior Nathan Fatigate and seniors Brandon Oswald, Josh Dowdy and Max Halvax won the race in 3:16.80 to break the 13-year-old school record and 25-year-old meet record and clinch the OC Championships team title. 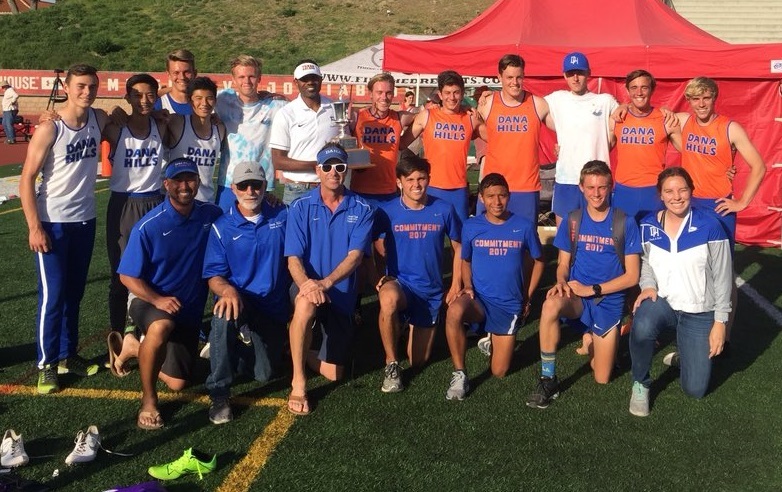 Dana Hills edged out Mission Viejo, 68-60, for the team points title. Halvax also took second in the 400-meter and fourth in the 200-meter. Dowdy finished fourth in the 800-meter. Senior thrower Max McKhann added to the championship cause with an individual title in the discus throw. McKann threw a personal-record mark of 179 feet, nine inches. Dana Hills’ distance team came through with major points in the boys 3,200-meter. Senior Jack Landgraf and sophomore Caleb Niednagel finished 1-2 in the two-mile race. Landgraf claimed back-to-back county 3,200 titles in 9:26.27, and Niednagel ran second at 9:26.82. Dana Hills’ girls 4×400 team claimed the only girls win for the Dolphins. Juniors Jaden Haskins, Ximena Bustos and Hailey Ray and sophomore Anisa Rind won the 4×400 title at 3:52.59.